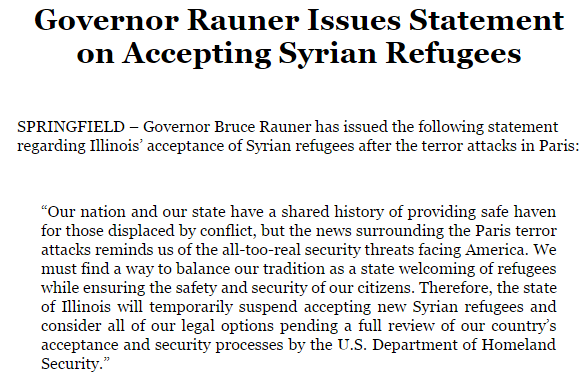 In a statement released by Illinois Gov.Bruce Rauner, Illinois will suspend the acceptance of new Syrian refugees. In a statement late Monday morning, Illinois Gov. Bruce Rauner said the state of Illinois will temporarily suspend the acceptance of new Syrian Refugees. Illinois joins at least seven other states – Alabama, Arkansas, Indiana, Louisiana, Massachusetts, Michigan and Texas – to not allow refugees from a war-torn Syria. All governors have cited security concerns following the terrorist attacks on Friday Nov. 13 in Paris. Like other statements from other governors, Rauner is suspending until there is a “full review of our country’s acceptance and security processes by the U.S. Department of Homeland Security,” as stated in the media release.